Kiowa Tribe of Oklahoma is a federally recognized tribe with headquarters in Carnegie, Oklahoma. Their tribal jurisdiction includes Caddo, Comanche, Cotton, Grady, Kiowa, Tillman, and Washita counties. Their language is part of the Tanoan family and is still spoken today. Leaving their ancestral homelands near the headwaters of the Yellowstone River of western Montana in the late seventeenth century, the horse-seeking Kiowa and affiliated Plains Apache had migrated southeast through Crow country and had reached the Black Hills of Wyoming/South Dakota by 1775. Then in the early nineteenth century the two peoples had been pushed south of the Platte to the Arkansas River by the Lakota Sioux and Cheyenne. The new Kiowa and Plains Apache homeland lay in the southwestern plains adjacent to the Arkansas River in southeastern Colorado and western Kansas and the Red River drainage of the Texas Panhandle and western Oklahoma. Characterized by mild winters and ample grazing, the region teemed with bison and feral horse herds, and the Kiowa developed an equestrian, bison-hunting culture. The Kiowa and Plains Apache initially skirmished with the more populous Comanche before creating a confederation between 1790 and 1806, and by 1840 the Kiowa had forged alliances with the Lakota, Cheyenne, Arapaho, and Osage. Provisions of the 1865 Little Arkansas Treaty forced the Kiowa and Comanche to relinquish lands in Kansas and New Mexico, and the 1867 Medicine Lodge Treaty established a 2.8 million acre reservation in southwestern Oklahoma. There the Kiowa, Comanche, and Apache were confined following their subjugation at the end of the Red River War in May 1875. Kiowa-Comanche-Apache (KCA) Reservation lands were allotted in 1901 and 1906 following the controversial 1892 Jerome Agreement and the landmark U.S. Supreme Court decision Lone Wolf v. Hitchcock (1903). In the year 2000 more than four thousand out of approximately 12,500 Kiowa lived near the towns of Anadarko, Fort Cobb, and Carnegie, in Caddo and Kiowa counties, Oklahoma. At the beginning of the twenty-first century the Kiowa remain one of Oklahoma’s most vital American Indian tribes. 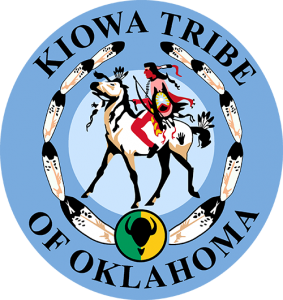 Today, the Kiowa Tribe of Oklahoma works effectively and efficiently to provide their tribal members with resources and programs that enrich their lives. These programs include commerce, education, government, and health with services ranging from child care, food distribution, transportation, and housing. The Kiowa Tribe of Oklahoma is headquartered in Carnegie, Oklahoma. Their tribal jurisdiction includes Caddo, Comanche, Cotton, Grady, Kiowa, Tillman, and Washita counties.